Ancient India geography: India is a vast country. During ancient period many countries surrounding India were part of India. The climatic conditions were very favourable to agriculture because of no pollution in ancient period. During this period there were two main civilizations known as Indus valley civilization and Vedic civilisation. The Indus valley civilisation flourished on Indus River. Since, land was very fertile during ancient period many small villages cropped up along the river basin for cultivation. The water drainage system during Indus valley civilisation provided an excellent opportunity for improvement of trade and commerce. In the ancient period India had a very large land mass which included the present Pakistan, Afghanistan, Burma, and Bangladesh. 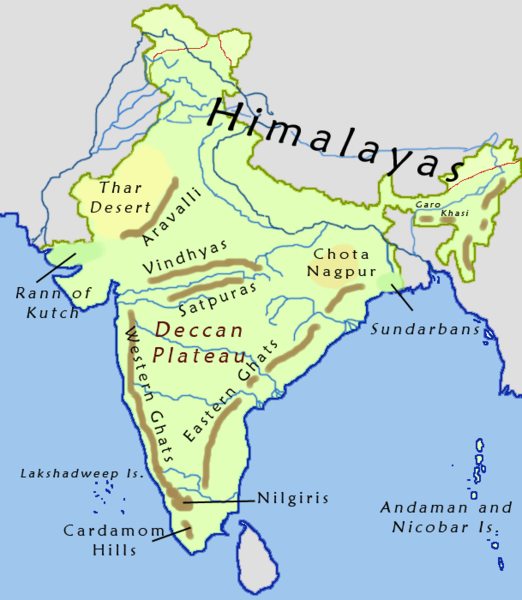 The Himalayas which act as a barrier and protect the Northern part of India were also present during ancient India. There were many rivers which are even mentioned in the holy books of Vedic civilisation. Some of the important rivers that were mentioned are Indus, River Sindhu, Gomati, Ganga, Yamuna, and Saraswati. River Saraswati which was very famous is not seen in the present India. These rivers were ideal place for cultivation. India got its name from river Indus. These rivers are very huge in size and the land near these rivers is very fertile. Most of these rivers get water from the Himalayas. The Indus Gangetic plane was very fertile and produced rich crops like wheat, barley and the lower Gangetic plane produced rice. The geography of India is very interesting. It consists of rivers, mountains, desert, land and forest. The southern part of India even in ancient period was covered by three side Sea. It is called as Deccan plateau. The seas are Arabian sea towards the west, the bay of Bengal towards east and Indian ocean towards south. There are certain changes in the geography of present India. Many states have become country of its own now.